As we drove west from Petaluma towards the Pacific Ocean then north up the coast, we had another delicious taste of the dramatic and breathtaking coastline. Steep cliffs, rocky shards emerging just off the beachfront, the ever-present fog, all along the winding and nail-biting Highway 1. We passed through picturesque beach towns like Bodega Bay (where "The Birds" was filmed), Jenner (with its colorful houses stacked on coastal hills), Gualala (really fun to say) and Sea Ranch (a bizarro planned community where every house looked the same). They were all distinctive from the rest of the California beach towns we had driven through; I'm not sure if it was the fog, but they weren't playful and bright like the southern and central coast. There was a somber, muted tone that we would find more of along the Oregon Coast. After a longer-than-expected drive, we finally made it to our destination: Fort Bragg. One of the larger North Coast towns, Fort Bragg is beautiful in it's foggy mysteriousness. Right away, we noticed the prominent fishing presence that seems to dominate the town. I'm not sure if we had been jaded from all the affluent beach communities we had passed through, the ones where people summer and have second homes, but after visiting the local grocery story I realized…Fort Bragg was a little bit redneck-y. Sure, there were a few shops on Main Street that catered to tourists and I would imagine people from the Big City come up to Fort Bragg to get away from the hustle and bustle, but this city was blue collar through and through. Not that that didn't stop the two activists picketing "Occupy Fort Bragg" signs in the middle of town. After spending a few days working at our campsite by the inlet docks, it was time to do some local exploration. Stop number one was MacKerricher State Park, one of our suggestions. 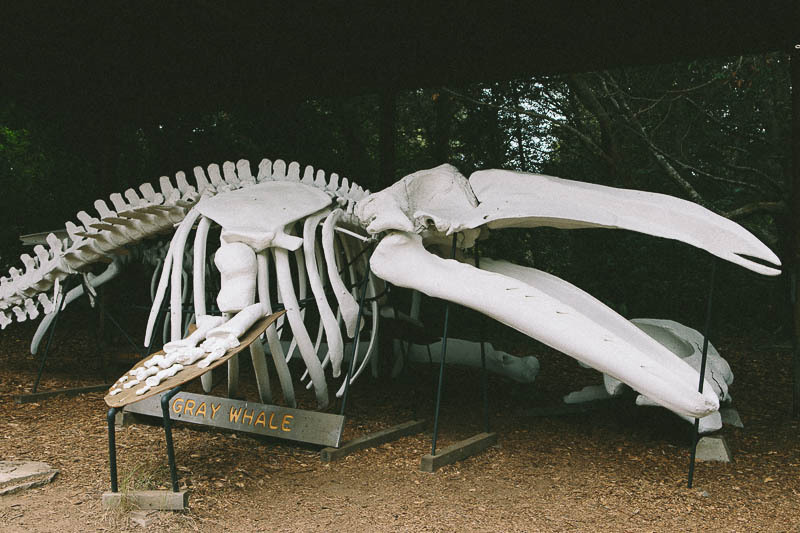 There were no spots available to camp there (CA state park campgrounds are booked weeks in advanced….plus they're pricey), but we heard there was a gray whale skeleton, tide pools and some beautiful coastline. They did indeed have a huge whale skeleton assembled at their main entrance. 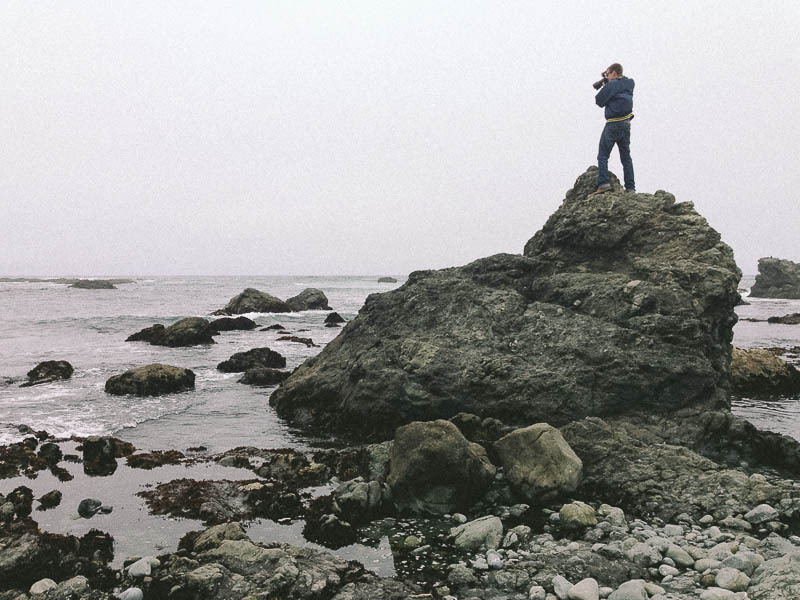 We took Bulleit for a walk along the beach, which was studded with gnarly boulders that John took the opportunity to climb upon to get a better shot. The sky was foggy and gray, matching the monochrome palette of the rocks, the water and the sand. 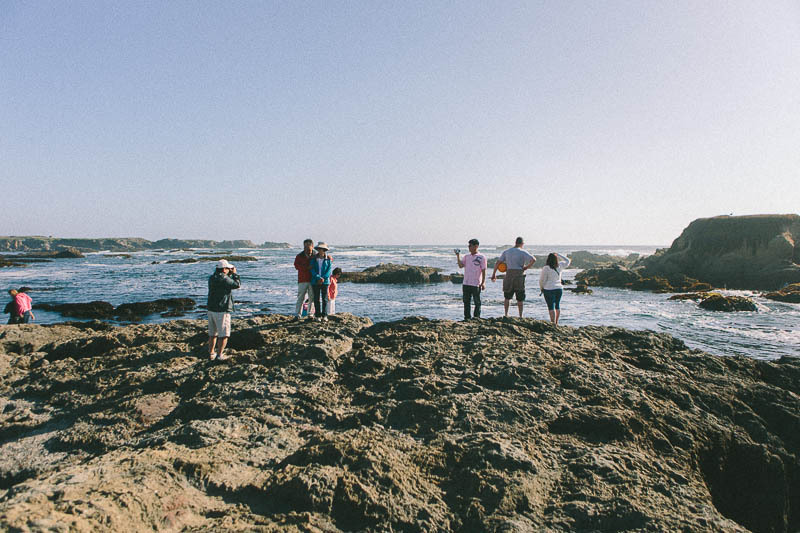 Fort Bragg is known for their Glass Beach, which was our stop number two. Rumor has it that years ago, the people of Fort Bragg would just dump their garbage into the ocean. 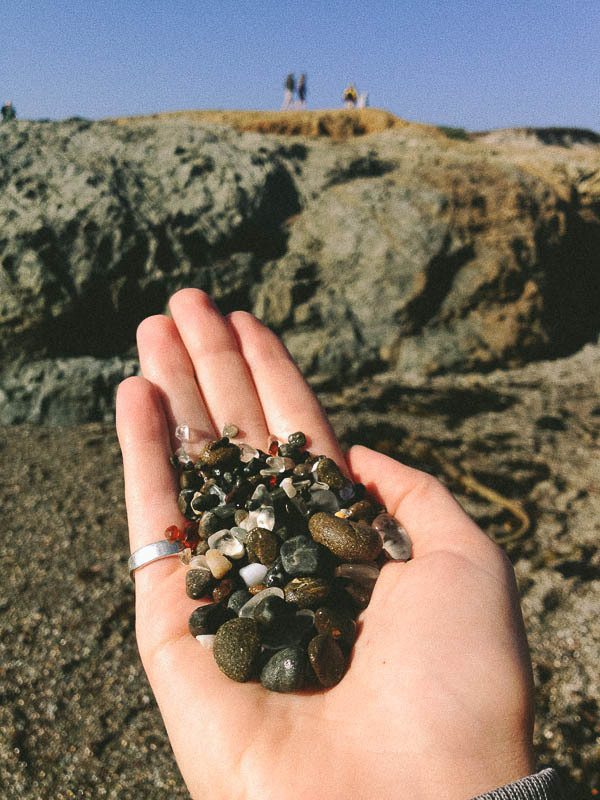 Over decades, the glass that was thrown into the sea was carried back to shore, shattered by the crashing waves and eventually smoothed into multi-colored glass pebbles. Now the beach at Glass Beach has green, brown and clear glass pebbles interspersed among the sand. We went on a clear, blue-sky day and dug out hands into the Glass Beach. To our surprise, we didn't get cut by shards of glass! 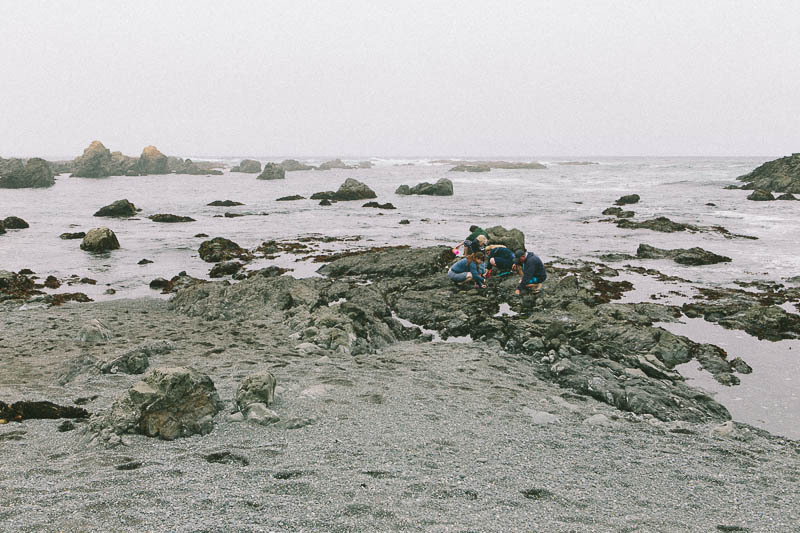 After breaking the rules and picking out a few specimens to add to my steadily growing rock collection, we walked among the many tide pools, peering into the tiny sea worlds of anemones and little fishes. We had a decent time in Fort Bragg, but after our first taste of the northern California coast, we wanted more foggy dramatic coast-mountain-forests all rolled into one. We headed north. 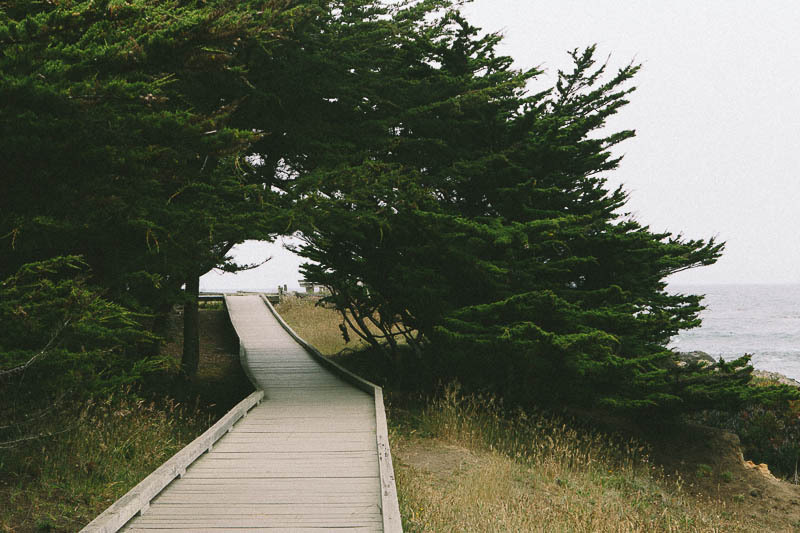 Special thanks to Jan (who suggested Surfwood Campground ) for making this blog post possible!